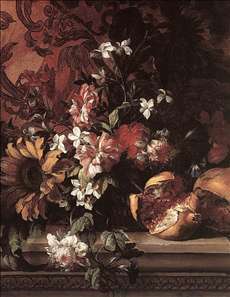 Franco-Flemish flower-painter who was trained in Antwerp, but became a member of the Academy in Paris in 1665 and worked for Louis XIV. 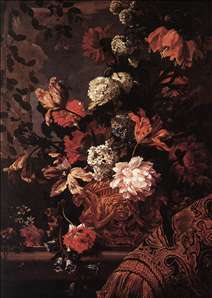 It is said that he was annoyed because his son Antoine, an inferior flower-painter, was allowed to alter some of his works, and in a fit of pique he went to London c. 1685. There he worked for the Duke of Montagu s new (and very French) town house (many of these pictures have passed by inheritance to the Duke of Buccleuch) and he remained in London until his death. 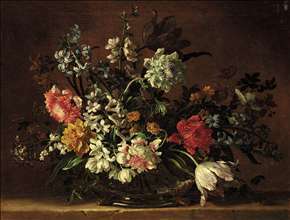 His flower-pieces are rich and splendid, yet painted with the greatest regard for botanical accuracy: they frequently appear in English sale-rooms under his nickname Baptiste . He also published books of engravings of flowers. Many pictures have been wrongly attributed to him, and his oeuvre is difficult to define because of the lack of signed and dated pictures. 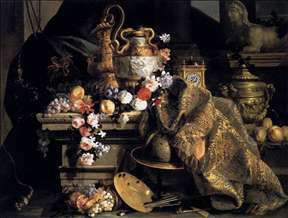 See more details about "Flowers"
See more details about "Still-Life of Flowers and Fruits"